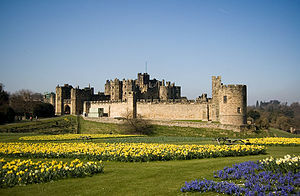 Alnwick Castle (Listeni/ˈænᵻk/ an-ik) is a castle and stately home in the town of Alnwick in the English county of Northumberland. It is the seat of the Duke of Northumberland, built following the Norman conquest, and renovated and remodelled a number of times. It is a Grade I listed building and as of 2012 received over 800,000 visitors per year.